This was definitely a bucket lister and a trip that had been in the making for about a year. 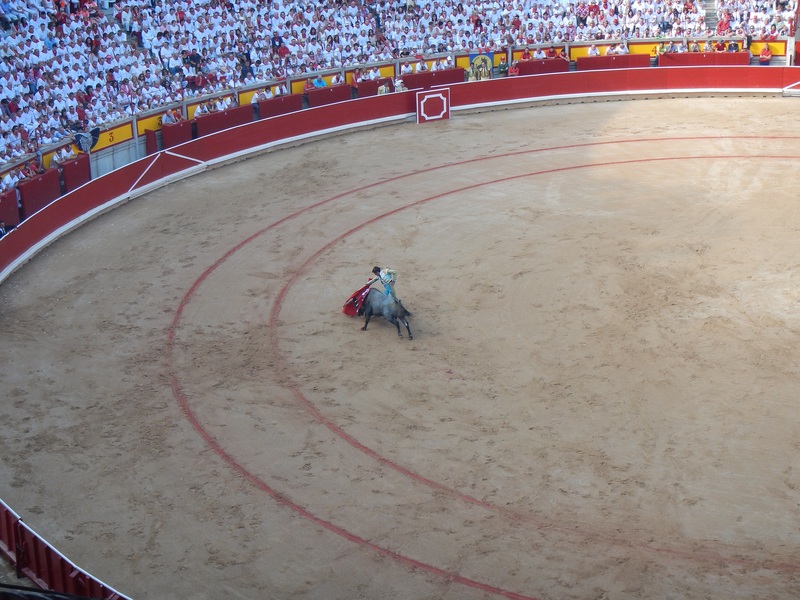 It all began and transpired after I showed Evan a video of my good friend Zach in the bull ring. He saw the video and jumped on the idea to head to Spain and experience this crazy run, which really surprised me. Fast forward a year and several months of traveling later, Evan and I met in Barcelona. 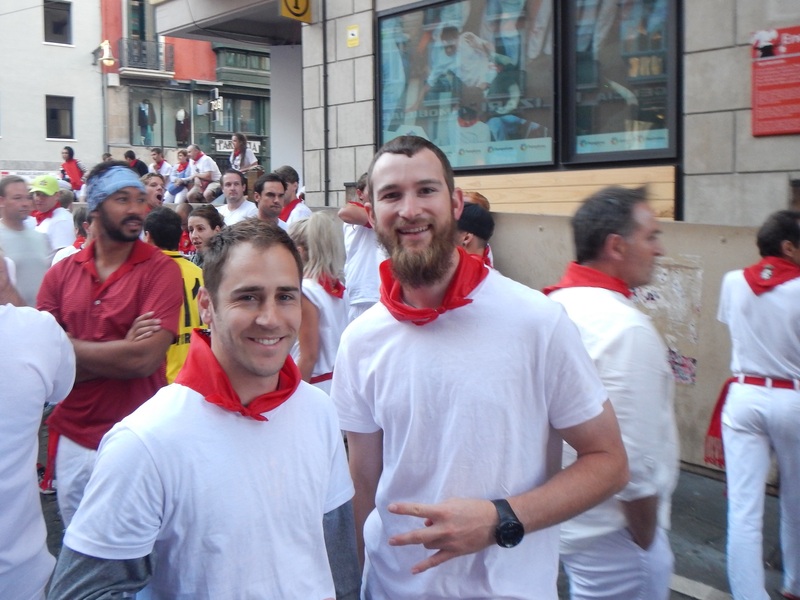 First, I couldn’t believe I was actually meeting him and second, we were actually headed to Pamplona!? Arriving into Pamplona on the train, we found our hotel and settled in before heading out to explore the town. 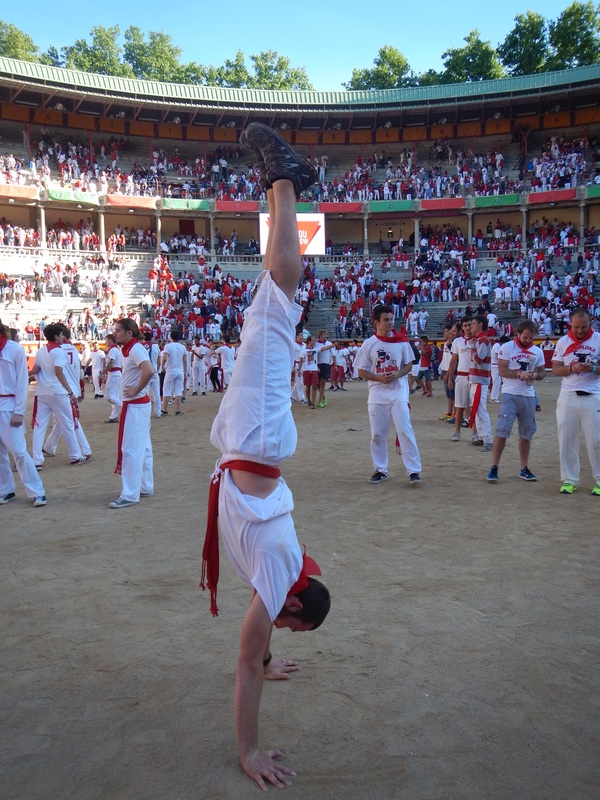 We had 3 nights scheduled to be in Pamplona and it was the perfect amount of time. A day to watch and figure out the run and then two days running! This festival is huge and the streets are just crowded and packed with people everywhere. 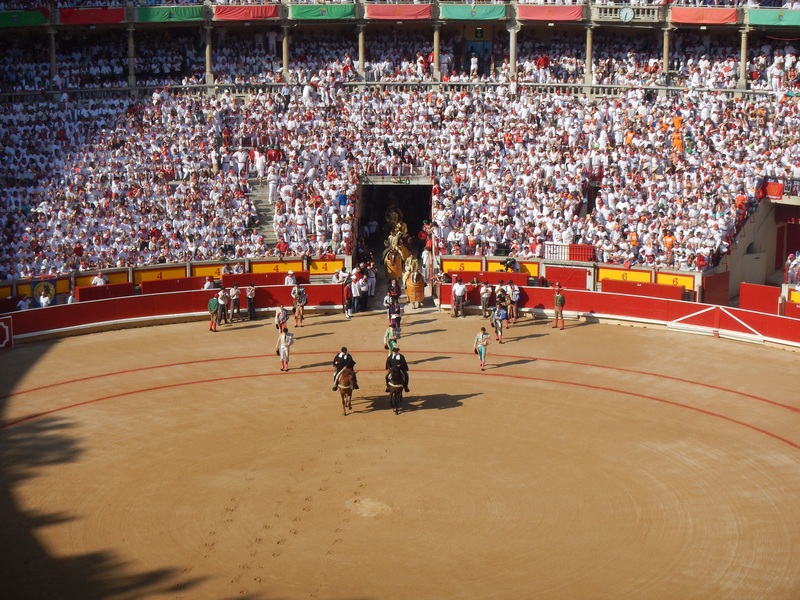 Activities go on 24 hours a day which include concerts, clubs, bars, bullfights, a fair, and fireworks just to name a few. Our first night we spent walking around enjoying a couple drinks and getting our bearings to where the run was going to take place. Of coarse we couldn’t forget the most important thing…buying our outfits. 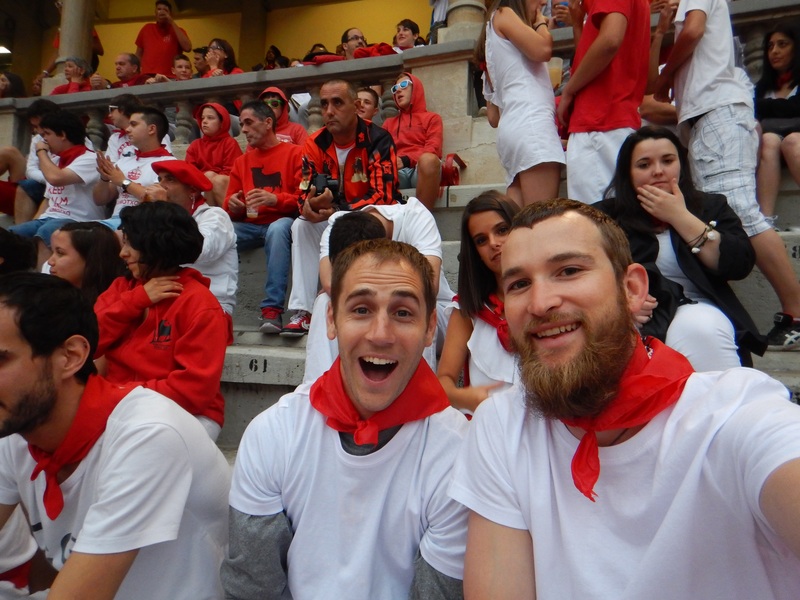 We had to, it’s just standard for everyone to wear the same thing, white pants and shirt with a red bandana and sash (cost €12). Needless to say, we caught a few hours of sleep before waking up just after 5am to go find a spot to watch the run from. 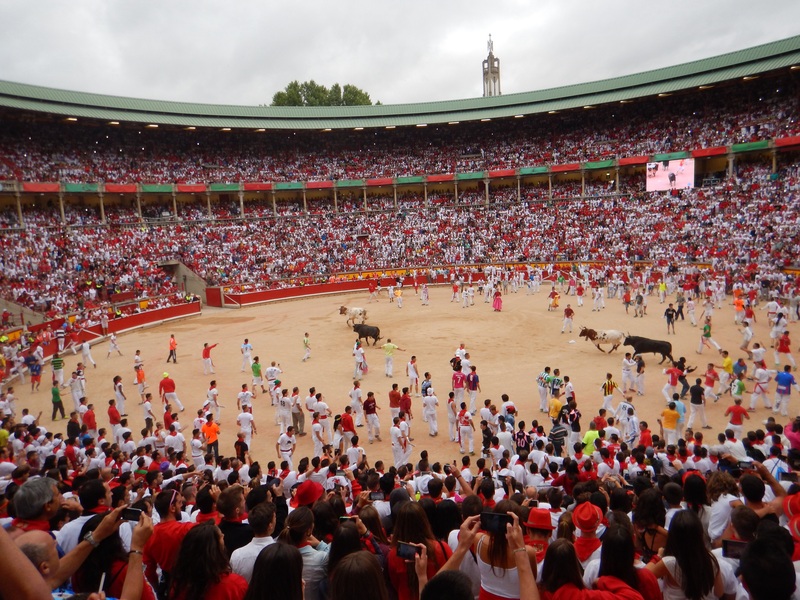 There are a couple places along the fence you can view the run but we decided to opt for the bull ring. Tickets are cheap(€6) and it is definitely worth it. 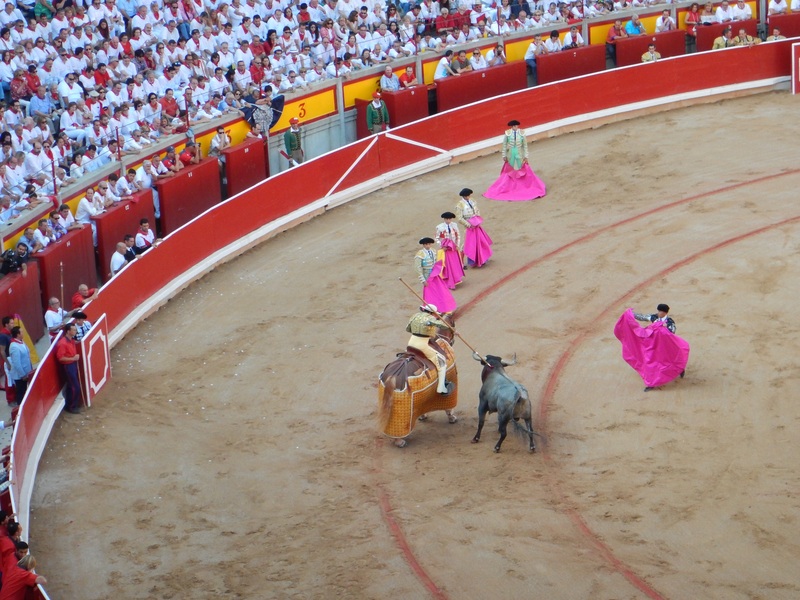 The whole run is played on the television in the stadium and you get to see everyone run into the arena with the bulls. 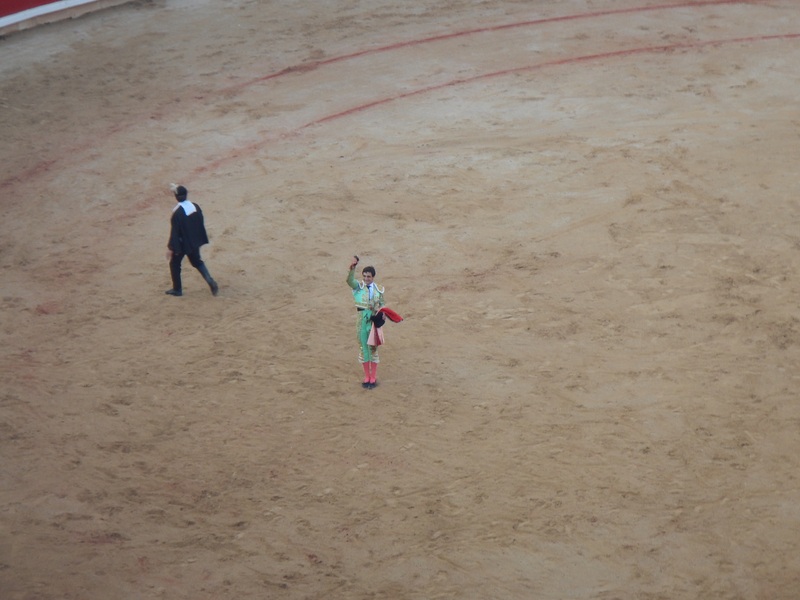 After the run is over, vaquillas (smaller cows with their horns taped) are released into the ring for participants to try their hand at dodging the charging vaquilla. Fortunately or unfortunately, not sure which one yet, but some people aren’t too lucky and next thing you know they are flying through the air. After the run and bull ring, it was time to grab some food and get a couple more hours of sleep. 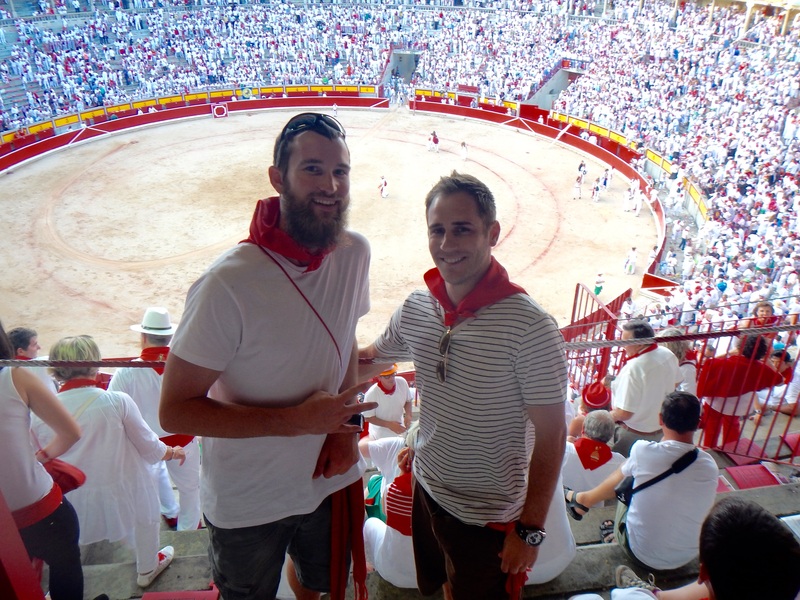 While in Pamplona we had to go and experience a bull fight. These took place each night during the festival and we bought our tickets(get them from the ticket office and not the scalpers they try and rip you off) and headed into the arena. It was very interesting to say the least. 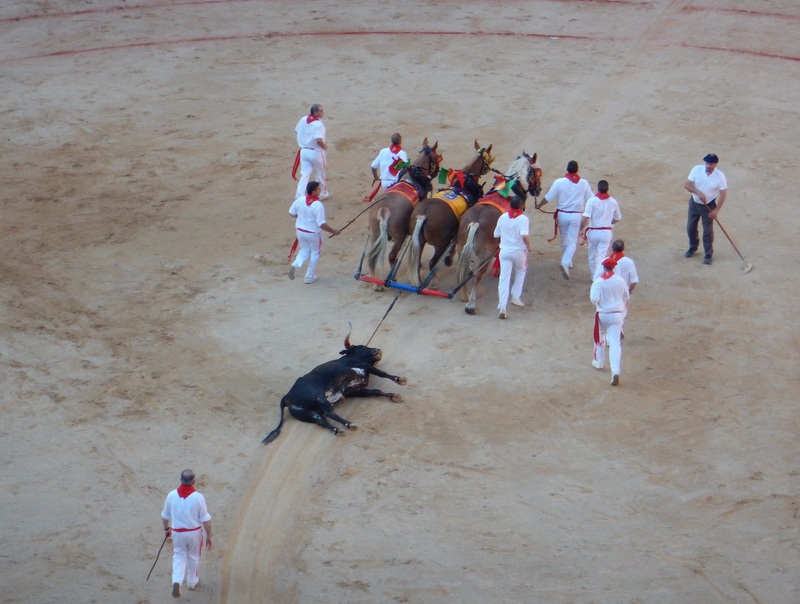 The purpose of the fight is to put on a good show and demonstrate mans dominance over beast. 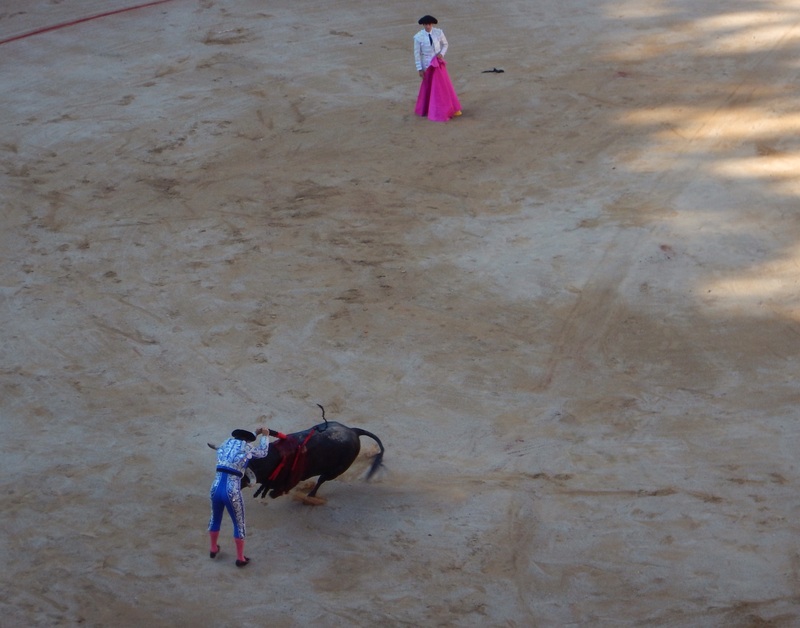 In the end the bull never wins and the Matador is rated on his performance by the spectators. 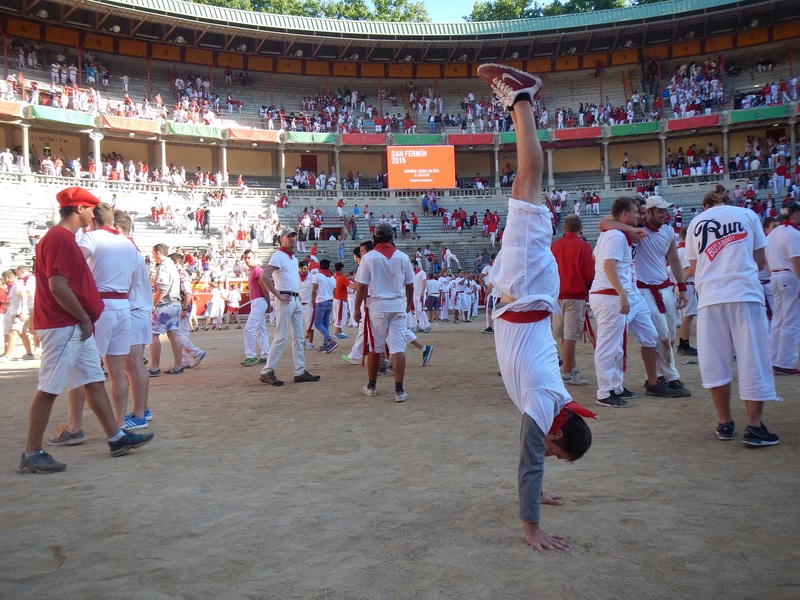 It was definitely an experience and part of the culture both Evan and I wanted to see. Today was the day! Waking up nice and early again we headed down to pick our place for the run. With plenty of time, we entered in where we were supposed to and walked down the street to our predetermined spot. Well 45 minutes before the run was supposed to start, police officers started clearing the street and that’s when we realized we were being kicked off the course! Sprinting back around back to the waiting area, we arrived with just minutes to spare. Quickly, we climbed through the fence and were back in. Crammed in with everyone else, we waited for the gate to open at 7:50 making it possible for all the runners to spread out down the street. It was about to start! 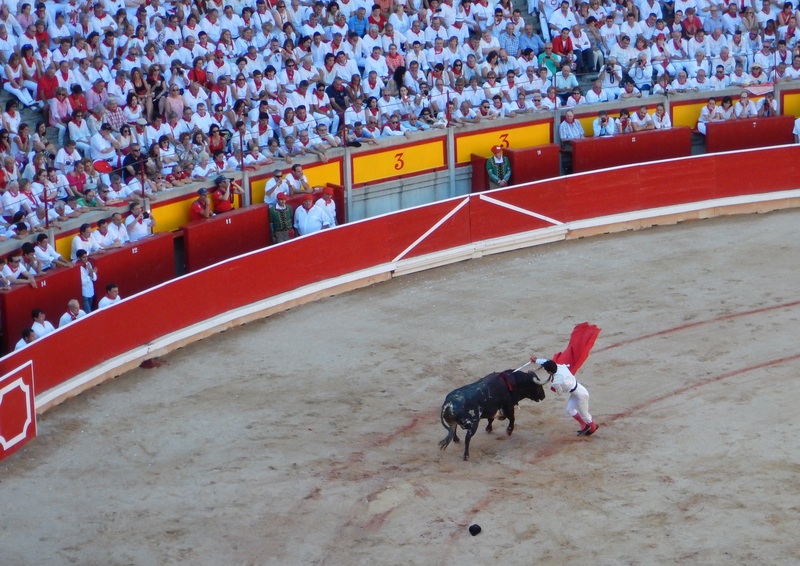 With our chosen place on Estafeta Street the canon went off and the bull run had began! By this time both Evan and I were getting a little nervous and before we knew it the bulls were barreling down the street. The run was on! With this being our first time, neither Evan or I knew what to expect and we ended up getting pushed against the wall by the masses. 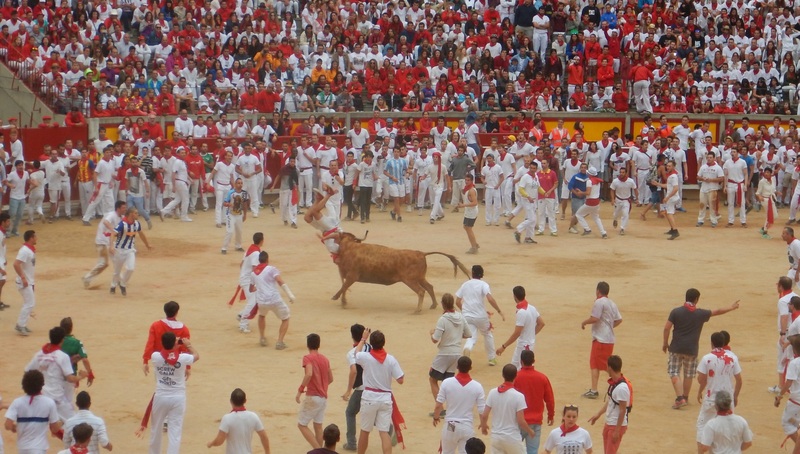 In the span of about 5 seconds, the bulls had run by. Pretty uneventful if you ask me. But we continued to run and made our way into the bull ring where we then saw people getting launched by the vaquillas that were released into the ring. It was crazy to be so close this time! 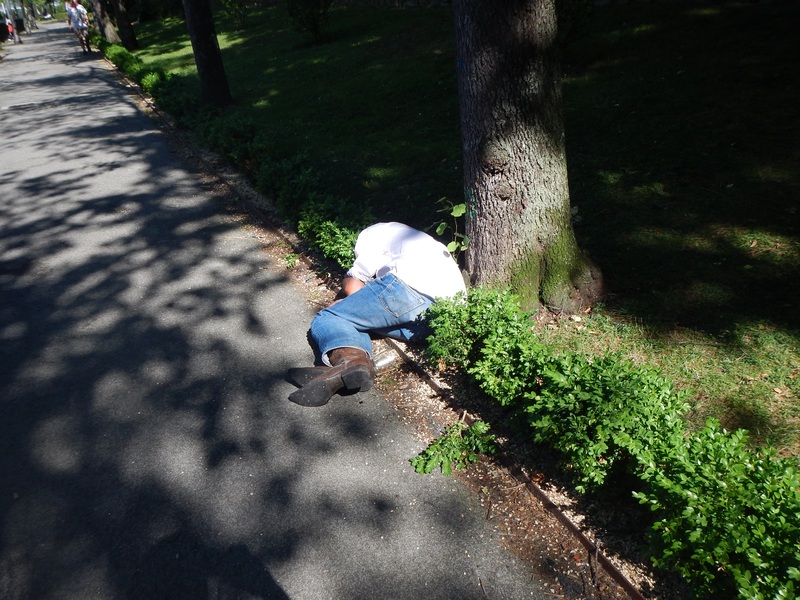 Afterwards, we grabbed some food and caught a little bit more sleep. Waking up, we headed back into the city and walked through the park. This seemed to be the place for everyone who partied all night to pass out and sleep during the day(talk about saving money on accommodation). 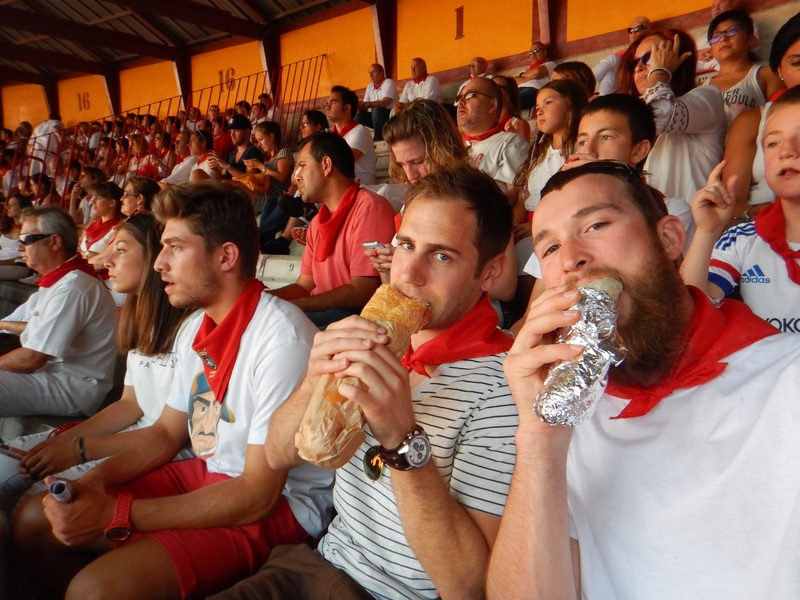 We went to the bull fight again and this time came prepared with food for the “meriendar” (late afternoon meal). Afterwards it was time for the evening fireworks show. 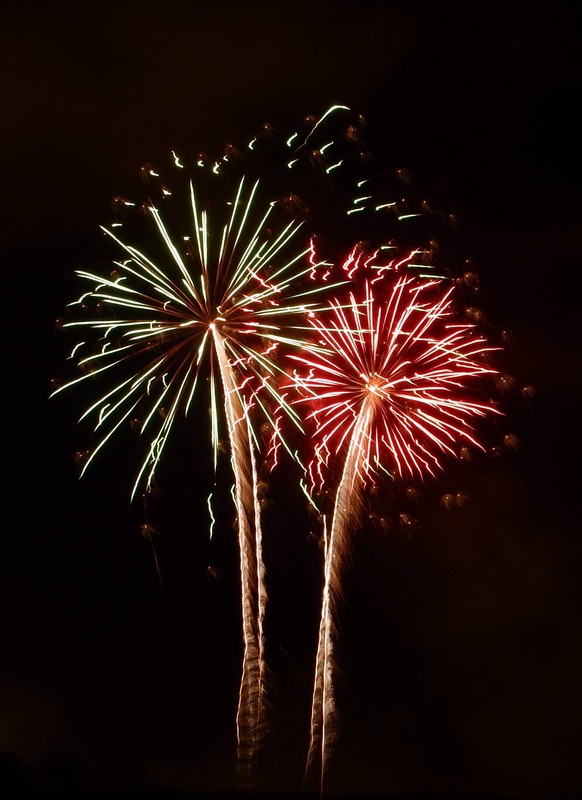 11pm every night, a fireworks show is displayed for everyone to enjoy during the festival. 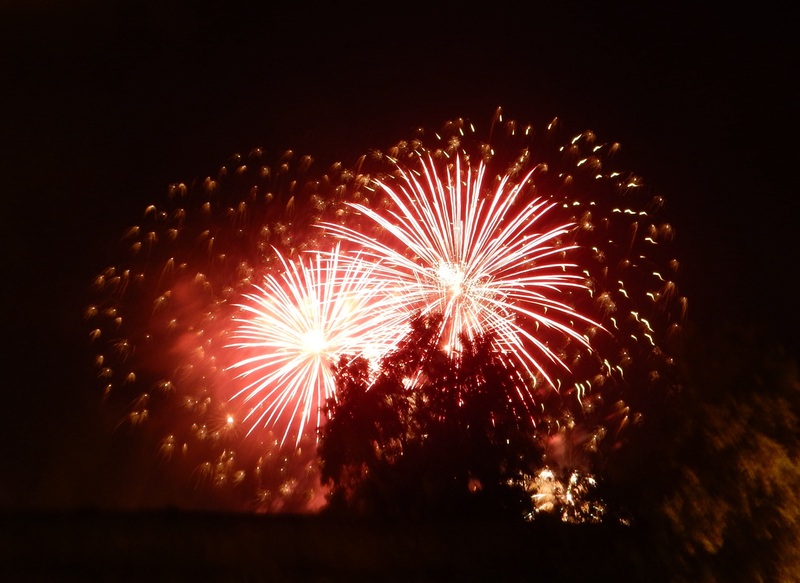 It is a good 20 minute show and let’s be real..who doesn’t love fireworks?! 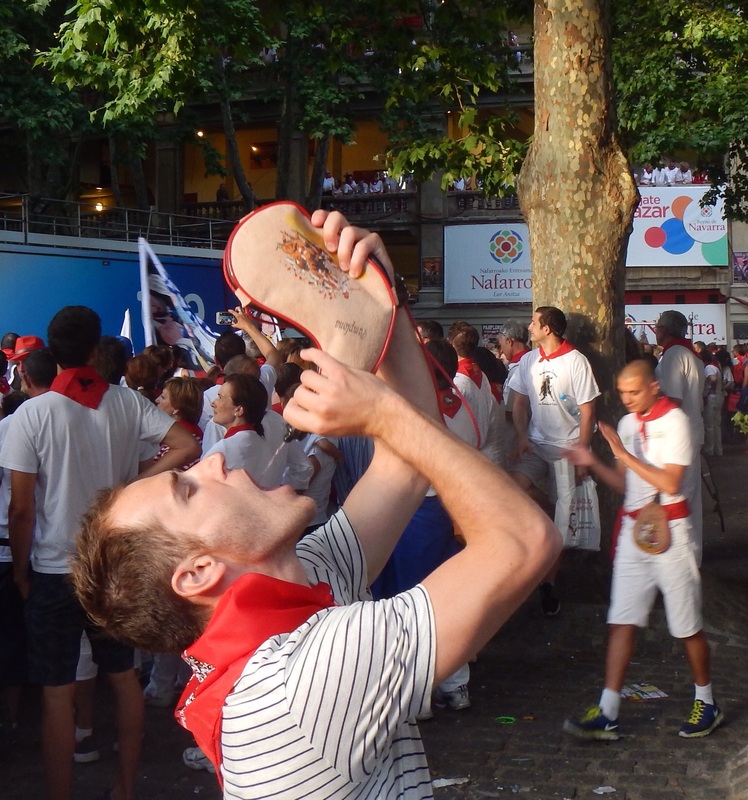 And this brings us to our final day at the San Fermin Festival. 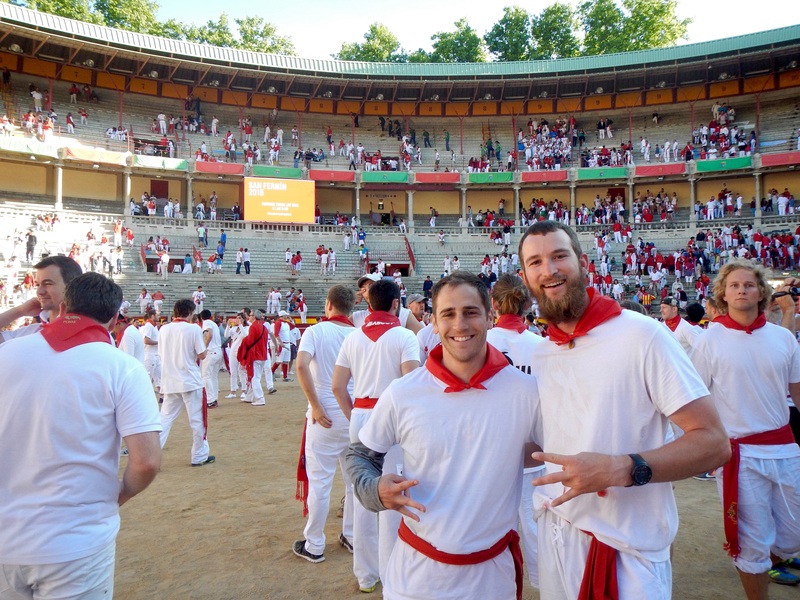 Round two of running with the bulls again! This time both me and Evan knew what to expect and showed up around 7:15 without worrying about rushing to the staging area. Since it was Monday morning, the crowd had thinned out a just a tad. I knew what to expect this time and it ended with me being a little more daring. 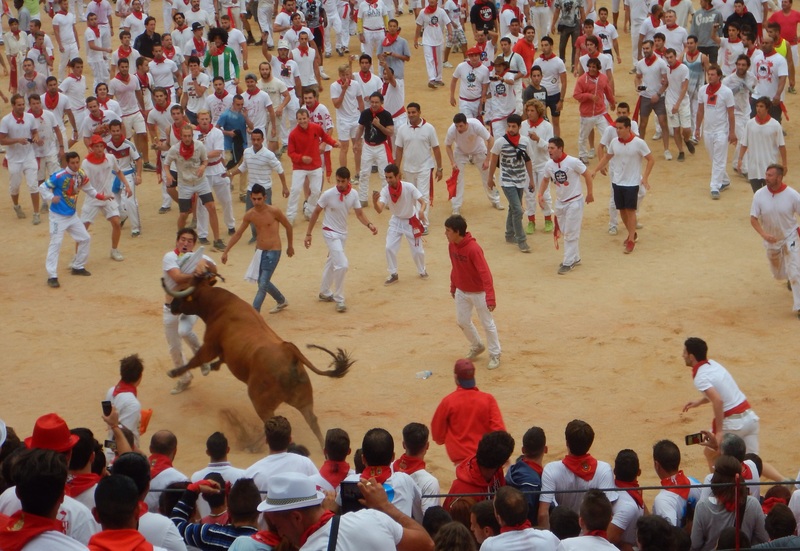 As I saw the bulls running down the street towards us, I pushed my way closer to the middle of the street. 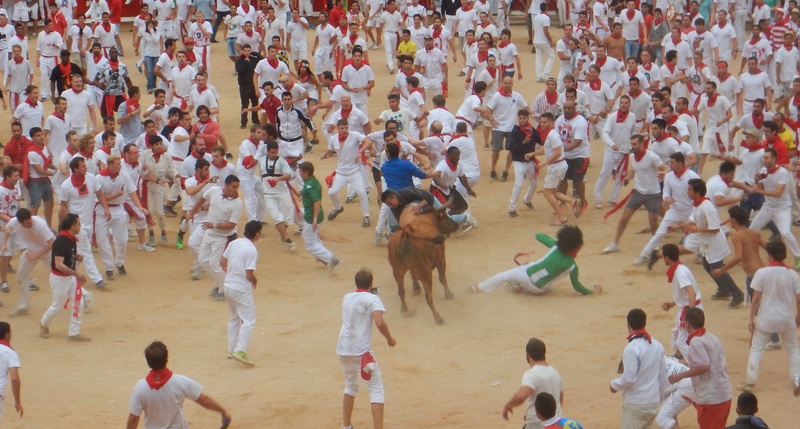 And then I was running with the bulls! Like right next to them and it was awesome! Excited and Ready for the Run! 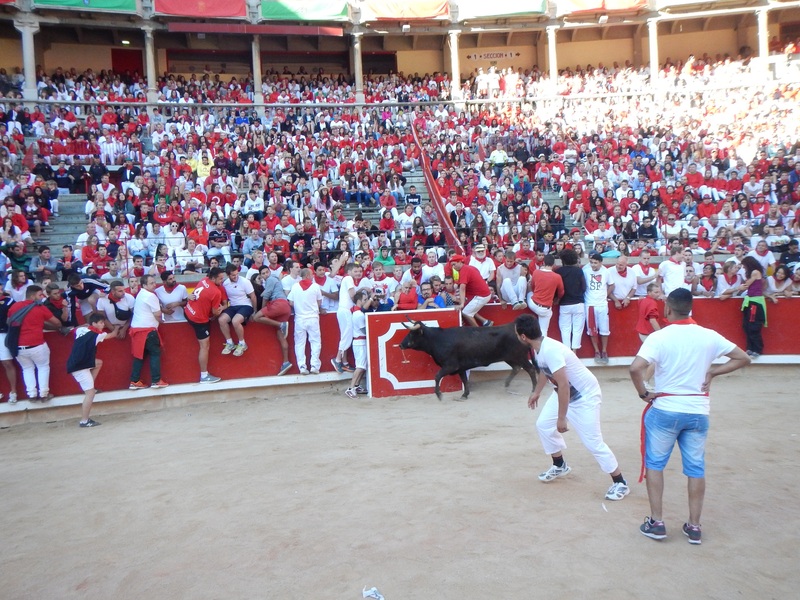 The fun didn’t stop with us running into the bull ring, we still had plenty of opportunities left to test our luck. And boy did I test my luck. If you didn’t know already, I enjoy doing crazy, not always smart things. Something about adrenaline gets me, and well this fit the bill perfect for my kind of fun. Before I knew it I was up close and personal with the vaquilla on several occasions. Luckily Evan brought his camera this time so I was able to get some videos. As I got more confident, the right opportunity presented itself and I sprung through the air over the bull…yea my foot ended up getting caught middle hurdle as I was just shy on distance. Landing and rolling out of it on the ground, I had been spotted. 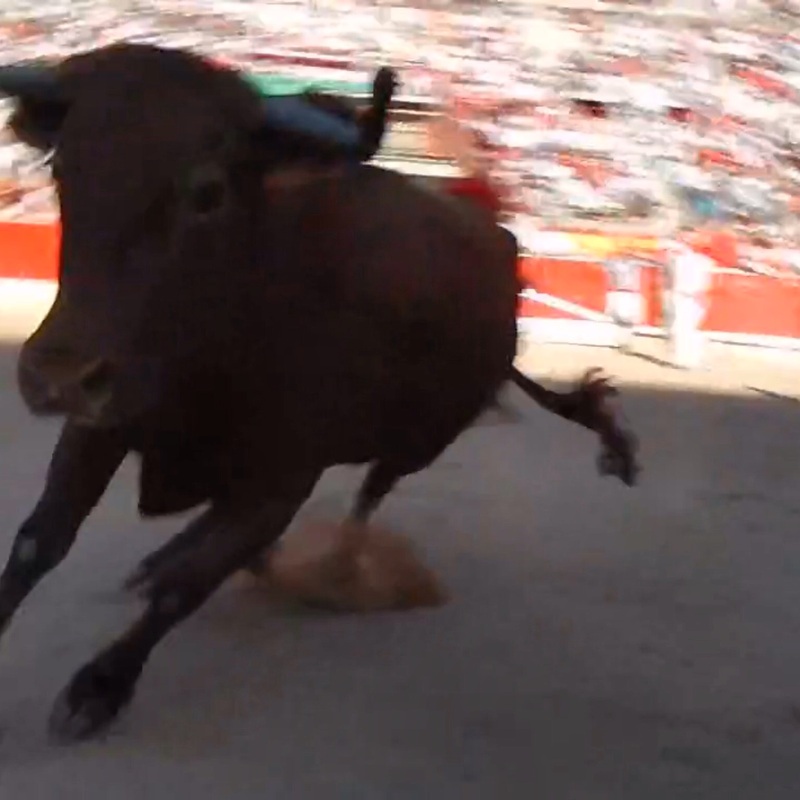 The bull spun around, faced me, and before I knew it I was airborne. It was crazy! I think the best part is Evan actually saw it all take place. I just got tossed and thrown into the air like a rag doll. Since I was able to walk away relatively unscathed, I can look back on the experience, laugh about it and say how awesome it was. This was definitely a trip to put in the books. Both Evan and I had a blast. 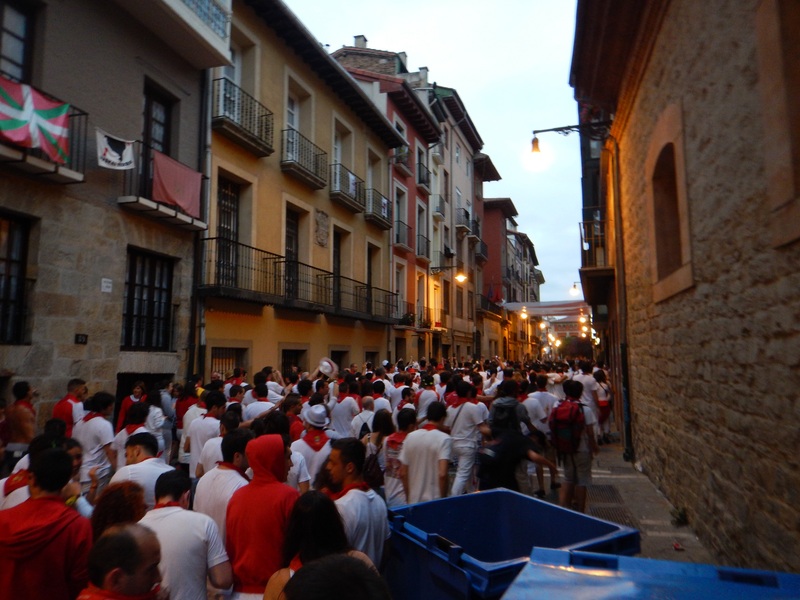 If for some reason you are on the fence about heading to Pamplona, get off the couch and go! It’ll be an epic trip and more fun than words can describe. Another video for your enjoyment. A close call! I’m glad I wasn’t this guy!